We’ll be here for you, 24/7, all winter long! The National Weather Service has forecast a deep freeze over the region. As the largest premiere service provider in Westchester & Putnam County, we want to make sure you have key information on staying warm through it. Our team is ready for the storm and working around the clock to make sure that you keep safe, warm and comfortable at home, providing oil deliveries, heating system repairs and more! We can install, repair and service whole house generators to keep you safe, warm and comfortable at home should you lose power. We can also assist with any plumbing emergencies or repairs and have our remediation team at 911 Restoration available to clean-up? Our local teams are here around the clock 24/7 to respond to your needs. We hope that you and your family stay safe and well throughout this major winter storm. Winter is officially here. With the cold air comes the need to rely on your boiler to help keep you warm and comfortable throughout the season. You’re probably reading a lot of articles about winter tips to keep your home, car, and even your body healthy in the cold. When it comes to your boiler, in addition to keeping you warm in your home, here are a few tips that will also help you conserve energy. It all comes down to service and maintenance. Make sure to watch and be mindful of the function of your radiators. Over the year, air becomes trapped and accumulates inside. Purge your radiators by twisting the purging valve with a screwdriver. Make sure to have a receptacle on hand to catch any water that comes out so as not to ruin your carpet. Twist the valve slowly until you hear a whistling sound from the radiator. Close the purging valve once the whistling stops and you see water droplets coming out. This tip allows the radiators to function more efficiently as air inside will cause uneven warmth. The normal operating pressure of your boiler should be between 1.2 and 1.5 bars. To check that your boiler pressure is within those bars, turn it on and then, after a few minutes, check the numbers. If you find that the pressure is too high, use the radiator purge method to release some of the air. If you find that the pressure is too low, the method is to open the tap, which allows more water in to reach the heating circuit. 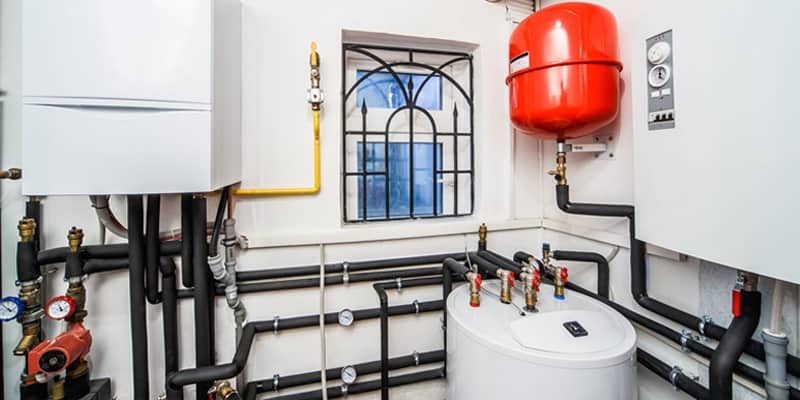 Boiler maintenance relies on regular service and cleaning. You can handle most of these tasks yourself, but in some cases, it will be necessary to have a professional technician take a look at your system. In terms of what you can do yourself, clean your boiler by checking the joints and air grilles. Ensure that they are clear and that nothing is obstructing it from operating correctly. For the joints, ensure that no air is getting in. If you are concerned about your equipment seizing up this winter, contact Robison for a professional boiler technician to come by as soon as possible. Keep in mind that we become busier in the winter due to the increase of boiler problems. It can be helpful to have a regular maintenance scheduled to ensure inspections and repairs happen quickly and efficiently. Still Feeling the Chill? Click Here to Contact Robison Today! So if you’re looking for a company that can handle all of your comfort needs with professionalism and courtesy, you’ve found a friend in Robison.